The houseboating capital of the world, and well known as one of the best recreational lakes in the nation, Shasta Lake is the ideal place for your luxury houseboat vacation. This magnificent body of water, with over 360 miles of shoreline, is the best that Mother Nature has to offer. Shrouded by the massive Shasta Trinity National Forest, Shasta Lake is home to over 20 species of fish, black tailed mule deer, bald eagle, osprey, ring tailed cat, California black bear, and a host of other wildlife. Summer days are very warm and sunny with high temperatures averaging nearly 100 degrees. Shasta Lake is primarily fed by rainfall, not snowmelt, making for very comfortable water temperatures – a heavenly 78-degree average in the summer months. 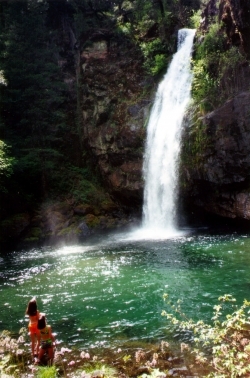 For optimal fishing and wildlife viewing, come to Shasta in the spring. The lake is at its highest level, and the fish are as abundant as the photo opportunities. Fall welcomes Indian Summer weather, comfortably warm days, and cooler nights. Whether it’s skiing, swimming, fishing, hiking, relaxing or spending quality time with your family and friends, you’ll find it on Shasta Lake. Houseboating is the best and most unique way to discover the lake. By day, a houseboat is the convenient hub for the day’s fishing trips, watersports, and swimming. By day’s end, you’re tucked into a secluded cove to prepare dinner and enjoy a peaceful evening in the top deck hot tub or luxurious cabin. UNDER SPECIAL USE PERMIT BY THE FOREST SERVICE U.S.D.A. 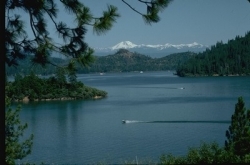 Shasta Lake Resorts, LP is an equal opportunity service provider operating on the Shasta-Trinity National Forest. If you experience or witness discrimination in services provided please contact the Forest Service Permit Administrator at (530) 275-1587.